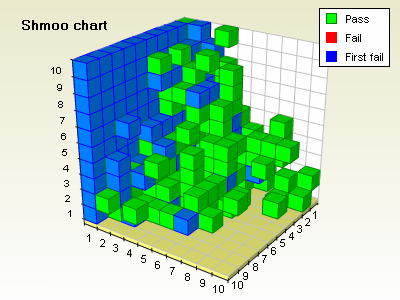 The 3DChart component can display shmoo charts. This chart is widely used in the semiconductor industry to show device response to two or three parameters. The user can hide all fail bits and highlight the first fail ones for one of the three possible parameters. Variations include hiding the fail bits as well as changing the first fail highlight criteria.